Recuva is small, powerful and freeware data recovery software to get your documents, images, videos, programs and archive files back in an immediate way. Basically, it gives professional way to get your data back that was deleted by mistake, formatted accidentally or lost due to data corruption. Recuva can be used on various external flash media including USB flash drives, memory cards, external hard disk drive and SD cards. It supports FAT, NTFS, FAT 16, FAT32 and other popular file systems. Unlike there are many data recovery software but they requires high value price to purchase a full version. 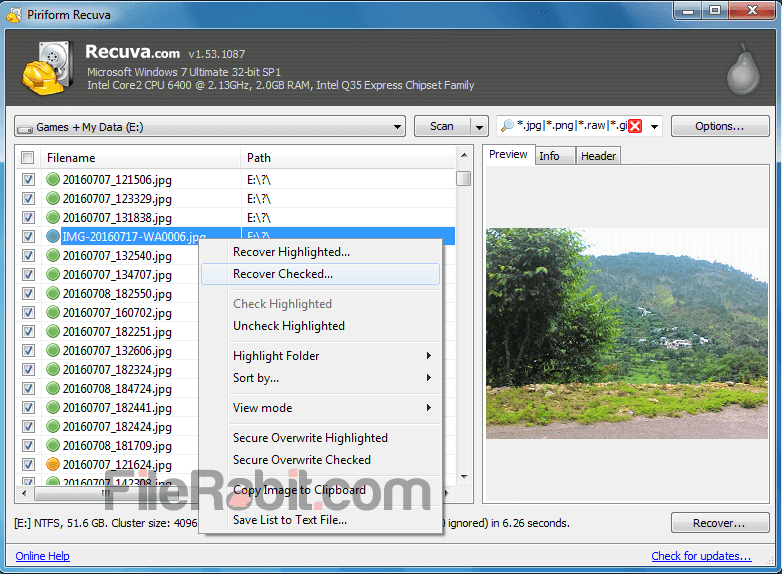 Recuva is an advanced tool designed by Piriform that already developed CCleaner, Defraggler and more popular products. A good news for Apple iPod users because now they can recover delete content from iPod devices. Virus attacks, crashing computer and unexpected power outages will corrupt or delete data from your computer in some occasions. However, it’s able to recover those files that were deleted even through pressing SHIFT + DEL button or in simple words, deleted from recycle bin. R Studio and Power Data Recovery are leading data recovery business but both needs high price to purchase a full version. Feeling worst whenever a user lost important data or information due to any reason mentioned above. It covers a wide support for documents, office files, pictures, music and videos. The speed of scanning internal HDD or external memory cards / USB flash drives. However, you can recover deleted files from MP3 portable players. Moreover, Recuva has ability to rebuild the structure of deleted folders from external portable devices or internal hard disk drive. It shows all files with relevant file extension e.g. JPEG, PNG, GIF etc. for image recover. All office document extensions including PDF, DOC, DOCX, XLX, XLXS and others can be recovered without wasting your money. It is not possible to recover those files that were replaced by others. Formatted camera cards, MP3 player or USB flash drives can be immediately recovered with 95% accurate results. Sort recovered content by size, file type, date etc.